Photo by Copyright 2014 Deborah Kaplan. 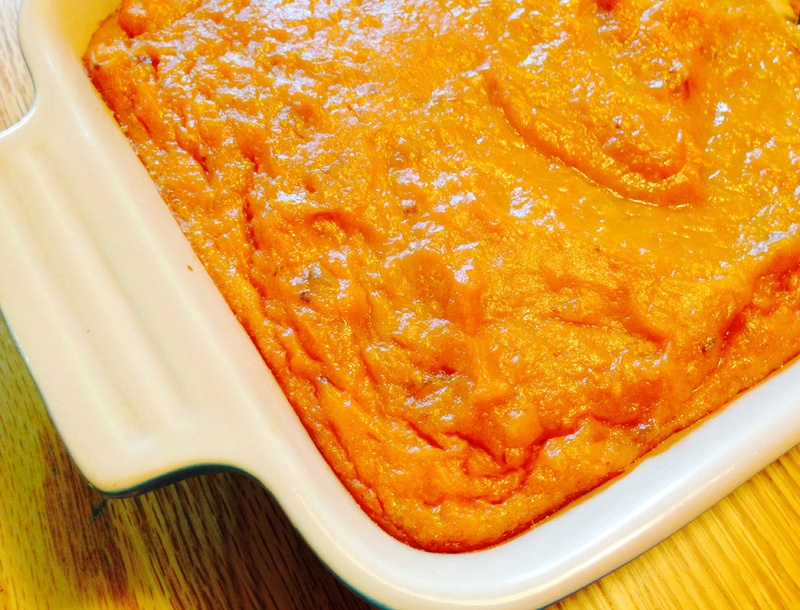 Sweet Potato Fluff is a delicious velvety creamy textured side dish perfect for a gathering of friends and family. It can also be prepared the day before and freshly baked the day of the party or event. It goes well with poultry, beef, pork or lamb and adds a beautiful color to your table and plate. I served it with grilled London broil, fresh Jersey sweet corn-on-the-cob, and salad. Everyone verbally loved the fluff, wanted the recipe as well as rated it 5 Stars. Rating recipes is a tradition in our house, and the majority rules. In addition, no one touches the food before photos are taken. Give potatoes a good scrubbing to remove dirt, then peel them and cut them into 1 inch sized pieces. On the stove, put them in a pot full of water just enough to cover them by 1 inch. Bring to a boil, then reduce to medium low, cover and cook for 1 hour or until potatoes are tender. Drain hot water from pot and refill with cool water, then drain again. Place potatoes back in mixing bowl and finely mash them. Add sugar, butter, flour, baking powder and vanilla and mix well. (Can whip it with a mixer for 1-2 minutes). Lightly whisk eggs together then pour them into potato mixture. Spray a 10″x 7″ baking dish with cooking spray. Place mixture into the baking dish and even out to one level. Bake mixture for 30 minutes.